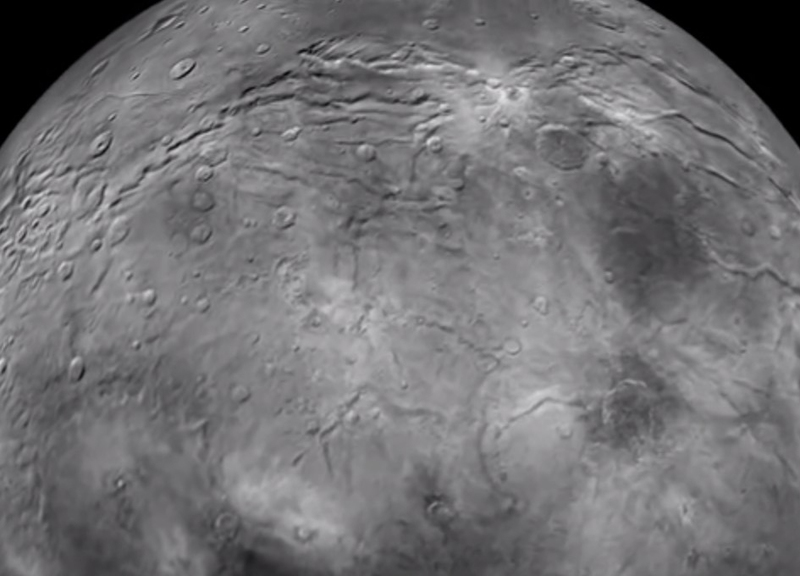 Images from NASA's New Horizons spacecraft were used to create this flyover video of Pluto's largest moon, Charon. The "flight" starts with the informally named Mordor (dark) region near Charon's north pole. The camera then moves south to a vast chasm, descending from 1,100 miles (1,800 kilometers) to just 40 miles (60 kilometers) above the surface to fly through the canyon system. From there it's a turn to the south to view the plains and "moat mountain," informally named Kubrick Mons, a prominent peak surrounded by a topographic depression. New Horizons Long-Range Reconnaissance Imager (LORRI) photographs showing details at up to 400 meters per pixel were used to create the basemap for this animation. Those images, along with pictures taken from a slightly different vantage point by the spacecraft's Ralph/ Multispectral Visible Imaging Camera (MVIC), were used to create a preliminary digital terrain (elevation) model. The images and model were combined and super-sampled to create this animation.